I love working on Children's projects... for several reasons. The cute factor is overwhelming! I love that for kids, you can use the brightest colors available! You can also be as creative as you want. If you can dream it up, you can do it. And the best part - children's projects are small enough to finish in a reasonable amount of time, so there is lots of instant gratification. 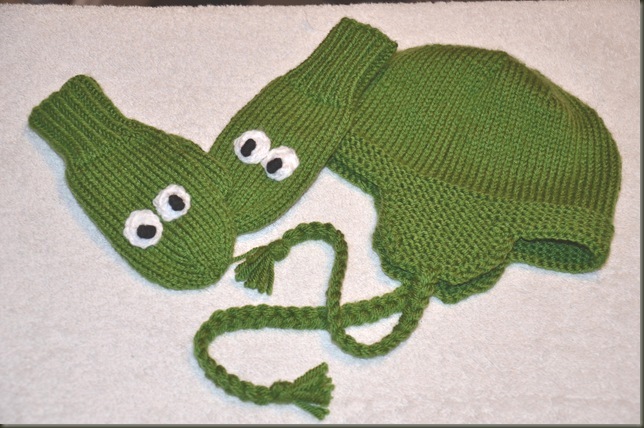 For this little set, I was asked to make mittens and a hat for a 4 year old little boy... who like most little boys, has a thing for alligators. this began the search for the perfect shade of Alligator Green! 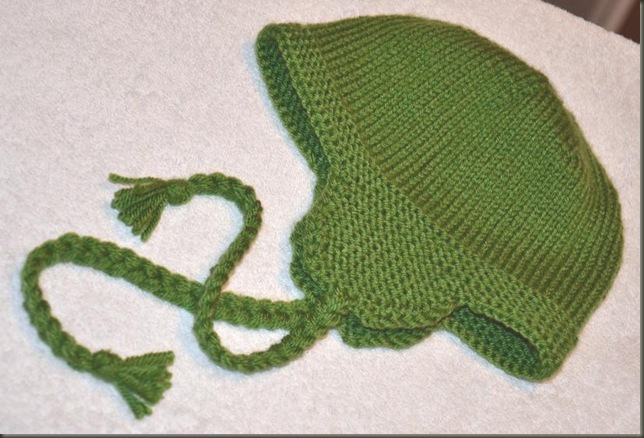 Normally, I gravitate towards wool products, but for this project I chose a nice soft acrylic (mainly for the indestructibility factor) and Vanna's Choice had a lovely mossy bright green. I set to work to find a hat that would be stylish, keep ears warm, but also be functional for everyday winter wear. I had been admiring Thorpe (available as a free pattern... follow the linky) for a long time, and had eventually intended to make one from handspun yarn for myself... This seemed the perfect opportunity. I made a few modifications (2 extra increase rows at the crown) to account for the fact that I was using a basic worsted weight yarn instead of a bulky one, and added a few stitches to the earflaps to account for the extra stitches... but other than that, I worked the pattern mostly as written and was very satisfied with the results. I always find it challenging to make hats for children because of the variety in head size... Maybe now that I'm going to have a child sized noggin at home I will be a bit more fearless? I consulted a bunch of different patterns to try and make sure that this would fit properly. I think I did ok in the end, because the Mom was pleased with the fit. I added crocheted eyes with black French knot pupils, and duplicate stitched teeth along the underside of the mitten. It was hard to photograph the tooth effect without having the proper sized hands to fit inside the mittens... but you get the idea. I hope there will be lots of "RAWR" moments and "love bites" with these mittens. Cuddly Crochet: Adorable Toys Hats and More - Interview with Designer Stacey Trock! As Promised... Here we are today with Crochet Designer Stacey Trock, some info about her new book and about her love of Crochet. In case you aren't familiar with the book (Cuddly Crochet: Adorable Toys, Hats, and More) this newly released paperback is full of creative and cute stuffed toys to crochet. From the standard teddy bear to more exotic animals like penguins and Koalas... these little softies have personalities all their own! 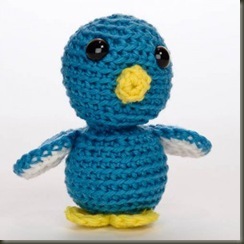 The little Blue Birdie is one of my favorites. Paired with each cuddly toy are other coordinating items, like baby blankets, hats, and bibs. I don't have any little ones of my own yet, but I will definitely be turning to this book next time a friend has a new little one on the way. The patterns look very straightforward, and include instructions for sewing together the toys and any unusual techniques needed. My Crochet technique is strictly from working doilies and afghans, so I will definitely need those tutorials! 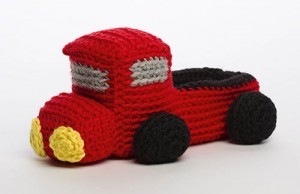 I particularly like the little red crocheted pickup truck - a nice change from the predominantly girl-oriented patterns for stuffed toys. And now... On to the Interview! Tell us a little bit about yourself! Where are you from, where do you live now, do you come from a crafty family? I was born and raised in Silver Spring, MD... and now I live approximately 10 minutes away :) My family isn't particularly crafty, but my mom taught me to crochet when I was very little... and they've always encouraged my craftiness! 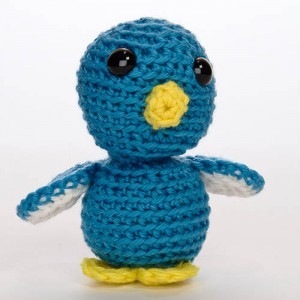 When / how did you learn to crochet? I think I was about 6 years old when my mom taught me to do the basic chain stitch. What was the first thing you made with your new found mad yarn and hook skills? At first, I just made a really long chain... I think that's what most kids do! Then, my mom taught me to make a flower (basically, a ruffle in a circle), and from there, I was off! I made a lot of things early on, but the thing I remember most vividly was a triangle-shaped caplet that I made when I was 12... it was brown and lavender... with a little lavender flower. I was quite creative! If you were an animal, what animal would you be? 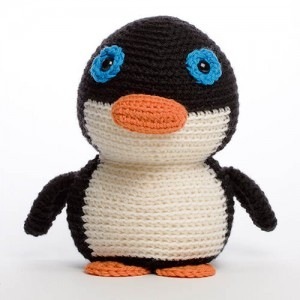 have you ever made a crochet toy of this animal? Definitely a dog. They're sweet and loving, hardworking and very perceptive.... all things that I strive for. And, yup, I've made one: Jeffrey the dog. About your designs... What is your designer style? i.e. do you create on the fly and then try to transpose your notes into a complete pattern? Are you methodical in your strategy? (always the same things first?) Do you use a computer or special software? Who is your Design Idol? I don't have too much of a process... most of the time, I just think up an animal and do it... with little sketching. Sometimes, I cruise around online and look at cartoon photographs, to figure out what the 'important' features of an animal is. I'm not very good with sketching... when I submit a design somewhere, the sketch is the thing that takes me the most time! I do use software for writing up my patterns... I use LaTeX to do most of my pattern formatting. A design idol... that's a tricky one. I don't have a person in particular, but I love Finnish and Japanese designers! The Japanese have always pioneered in the 'cuteness' industry (think Hello Kitty! ), and I always get a huge smile when I walk into a Japanese bookstore and see books on how to make panda sushi, next to amazing sewing patterns and adorable crochet books. What is your favorite crafted item that you have made from your own designs? What is your favorite crafted item of all time? (from any designer) Do you have a pic to share? We all like to challenge ourselves... Are there any techniques or styles of crochet that particularly challenge you? How do you deal with a new crafty challenge? I do love a challenge... and I usually dive in head first! Since I'm newer to knitting, I find there are a lot more techniques that challenge me: I've loved learning to double knit, knit two socks at a time, and knitting entrelac. The most recent technique I learned in crochet is hairpin lace, which was quite fun. I'm quite patient overall, so there usually isn't too much drama involved :) I just turn on a tv show and have a cup of milky coffee... and keep going until I get it done! What yarns make you weak in the knees? 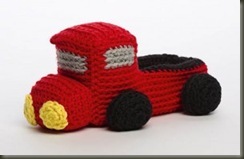 Are there any particular yarns that you find best suited to toy-making? Wool vs Cotton vs Acrylic? Fat vs Skinny Yarns? Oh... anything soft! Shepherd's Wool (by Stonehedge Mill fibers) has the softest merino that I've ever touched in my life... and I make whatever I can out of it. 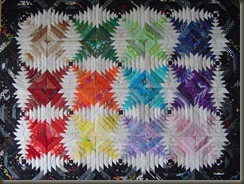 I'm also in love with Frog Tree's PicoBoo (a cotton bamboo blend), which I'm currently working with. I stick mostly to worsted weight, just because I love my size H hook! I'm open to experimentation, though. New book and fancy promo blog tour? Congratulations! What's your next big move? more pattern books? Your own line of Yarn? Appearances at crafting camps/festivals? teaching? Thanks! Well, I'm actually moving to Connecticut... but I'm not sure if that's what you wanted to hear :) I'd love to do a second pattern book... and I'd really like to focus on Earth-friendly yarns. We'll have to see if that pans out! I teach now, and I'll probably continue to do so. 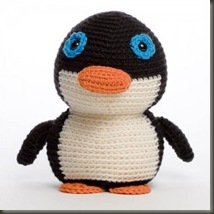 I'm planning a workshop on Amigurumi Design, which I think will be really fun. 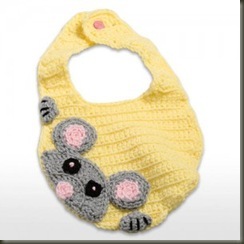 I'm also planning on expanding my knitting designs... Overall, though, I'm trying not to let my schedule get too booked. I love designing because it gives me the flexibility to work at my own pace, bake bread during the day and keep calm! I don't want to lose that! A perfect craft-filled day... where would you be? what would you be working on? who would be with you? would there be snacks/treats? Ooooh! I'd wake up, and it would be a wonderfully sunny & warm day outside. I'd go to a fiber festival with my boyfriend (because he's always willing to walk around and look at stuff... and he wouldn't have preferences about what yarns to look at!) and look at all sorts of new yarns, fibers and independent dyers. I'd have an awesome lunch (maybe barbeque?) and then take a really interesting class. Maybe something on spinning (I drop spin, but want to learn to use a wheel) or dyeing yarns. In the late afternoon, I'd have an outside sit & stitch with my yarn-friends, and we'd have sweet iced tea and lovely cookies. I'd be knitting on my Clapotis (which I really am working on), which is made from a delicious silk & wool blend... it's an interesting pattern, but easy enough that I can focus on the good gossip. Once it started to get dark, we'd move inside and I'd knit while we watched a great movie with popcorn. Thank you Stacey for the opportunity to be a stop on your Blog Tour! Best of Luck with Everything. Also a big thank you to Martingale Publications for allowing me to use some of their official Shots from the book. If you were a (stuffed) Animal: what Animal would you be and why!? Entries will be accepted until Midnight (Atlantic Time) April 30, 2010. For one extra entry, blog about this book giveaway, or twitter that you've entered this contest, and link back to this article! I find that a little knitting in my day helps to mellow me out, and help to recharge me when I am feeling like my attention span is waining. 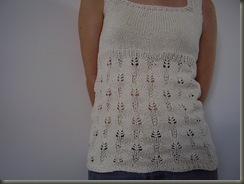 Often I will haul out a small project from my purse and knit a few stitches, even if I only have time for a few rows. It really is surprising how much knitting you accomplish in little dribs and drabs. I guess when you think about it, a mitten only has maybe 120 rows including the thumbs.. so if you manage to knit 5 rows on a 15 minute break, and maybe 10 at lunch, and maybe another 5 in the afternoon... thats 20 rows a day! if you could do that every day (and I usually find I can unless we have meetings scheduled or go out for lunch) I can get a mitten done a week just at work. That isn't even counting my knitting time when I'm at home. I think for some reason there is this perception that knitting is really time consuming and that it takes forever to get anything done. 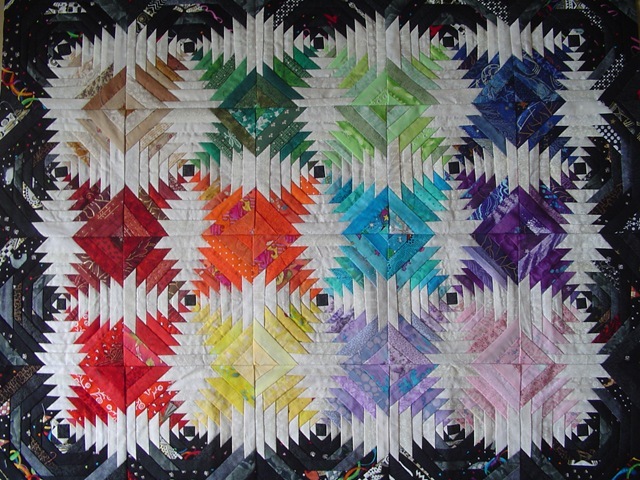 For me, just doing a few rows here and there means that I get lots accomplished on my projects each week without really having to set aside long stretches of time. even in the evenings, sometimes I will knit a few rows while waiting for supper to defrost, or while on the phone. I think the real secret to getting lots of knitting done is just to keep it with you, keep it accessable, and to knit when you have a few spare minutes. Those add up! I always find the sizing on Thrum mittens to be a bit of a Challenge, just because the mittens have to be a little larger than usual just to accomodate all the fluffy wool inside. That usually means making one size bigger than the child would normally wear. Also with Children, I don't worry about Over-Thrumming. As an Adult you may want to be able to feel the steering wheel through the mittens, or be able to hold that tiny purse handle... kids on the other hand need warmth, and more wool padding equals better efficiency for making and throwing snowballs with toasty warm fingers!